It’s that time of year where you just wait. Everything is planted, nothing is sprouted. Not just yet. I will be out of town later this month for vacation and other things, so I’ve been preparing for that. As for the garden, I’m just keeping it all watered. April, and even the first week of May, was too cool for any serious growing to happen, but we seem to have tipped the scales now and are hitting 80° F this week – up to 94° F for today! So I expect the garden to kick into high gear now. I’ve even had to cut the grass… which means that it has come out of its dormancy. Pico the cat loves chilling out in the grass. Pico is pretty special. We rescued him when his previous owner moved out of their home and left him behind. He’s very laid back. According to the neighborhood legend, he was hit by a car while in the care of his previous owner, and got his foot / leg broken. The previous owner took him to the vet, and now he walks funny. It doesn’t seem to bother him. Nothing really bothers him. 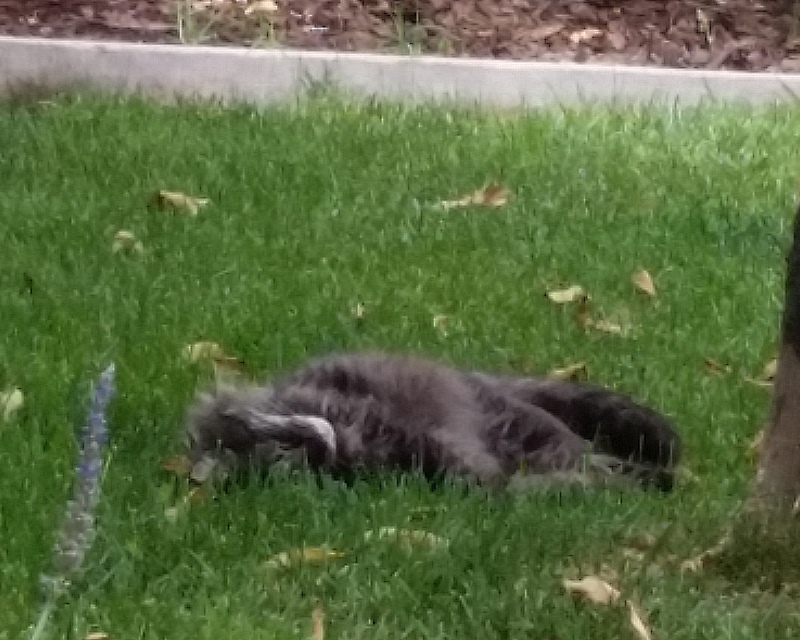 I’ve seen him sleep on the lawn while ignoring an attacking scrub jay. He likes to be petted. He also likes to mark his territory by spraying it – which is why he’s not an inside-the-house cat. I’ll do a little weeding tomorrow, and then it’s off to the beach for me and the missus.